Be Active, and Make It Count! Live Healthy Iowa’s Active Index is a measurable county-based tool geared toward encouraging Iowans – of all ages and activity levels – to engage in healthy and active opportunities. Our goal is to get everyone up and moving together toward better health! Since 1988, the obesity rate in Iowa has increased from 14 percent to 32 percent! Iowa’s less than desirable national rankings for obesity and inactivity are contributing to the overall health of the state’s residents. The Active Index is a catalyst for evoking change and improving the overall wellness of Iowa – person by person, county by county. 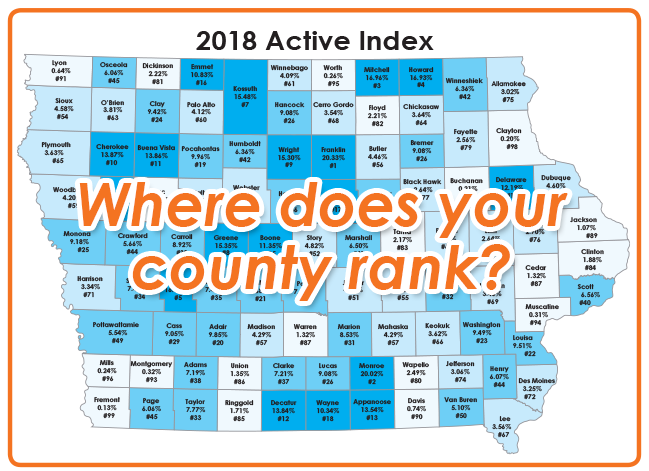 The Active Index provides a tangible measurement of where each county ranks across Iowa, which can serve as a baseline to motivate and inspire improvement. Rankings in the Active Index are based on county members' participation in select Live Healthy Iowa and Iowa Sports Foundation challenges and events - 10 Week Wellness Challenge, Live Healthy Iowa 5K, The Next Step Challenge, Kid's Fall Fitness Day/Healthiest State Walk, Summer Iowa Games, Winter Iowa Games and Senior Games. 2018 Active Index Rankings NEW! 2018 Active Index Map NEW!